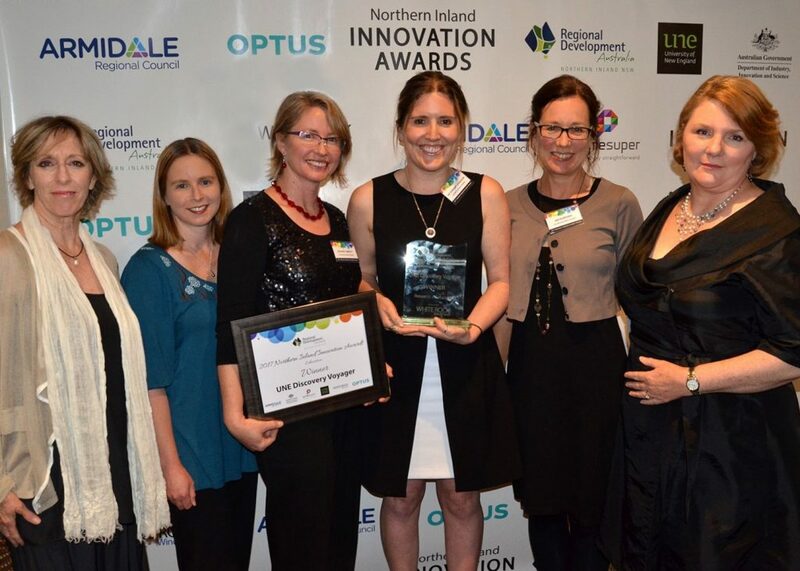 UNE Discovery Voyager team, winners of the Northern Inland Innovation Award for Research and Education. (L-R) Dr Chris Morton, Dr Jean Holley, Dr Kirsti Abbott, Dr Siobhan Dennison, Anita Brown, and local representative of White Rock Wind Farm, Sandra Royal, who sponsored the award. The Discovery Voyager program has been running since May 2017, taking hands-on, exploratory experiences in STEAM (Science, Technology, Engineering, Arts & Maths) to schools across northern NSW. Our team of Scientists and Science Educators has engaged with over 8000 students from Kindergarten to Year 10 in novel activities spanning a broad range of scientific disciplines, from Chemistry, Biology and Physics to Scientific Illustration, Palaeontology, and Sport Science. We even debuted a theatrical exploration of the Physics of Sound recently, which has been a great success. Our younger years are a time of great learning and neurological change which, research is revealing, is enhanced by exploratory and play-based learning. From increasing language, social, emotional, creative and problem-solving skills, the importance of play in children’s learning and overall development is becoming more and more evident. The UNE Discovery Voyager aims to harness this, offering transformative and exploratory experiences in a range of STEAM subjects, guiding students through concepts that align with and extend the Australian school curriculum. Our philosophy is one of play and exploration, giving students the time and space to think, question, explore and discover. Feedback from teachers and students about the program has been overwhelmingly positive, especially as the Voyager program caters for rural and regional schools that do not typically have access to programs like this. Discovery Voyager’s mission is to ensure that all students have the opportunity to explore science, to show how these subjects can be taught in an exciting and stimulating way, and to inspire teachers as well as students to explore the possibilities in engaging with science. Schools enjoy interacting with external professional scientists and educators, and engagement from a young age not only helps students think differently about science, but aids in their perception of what a love of learning can look like when pursuing tertiary study and life-long learning. Based in Armidale, UNE Discovery Voyager is a partner of the New England North West Regional Science Hub. Bookings are now open for 2018!